Blacks Brokers are proud to bring to the market this freehold micropub located in a busy and much sought-after area of Liverpool, Merseyside. 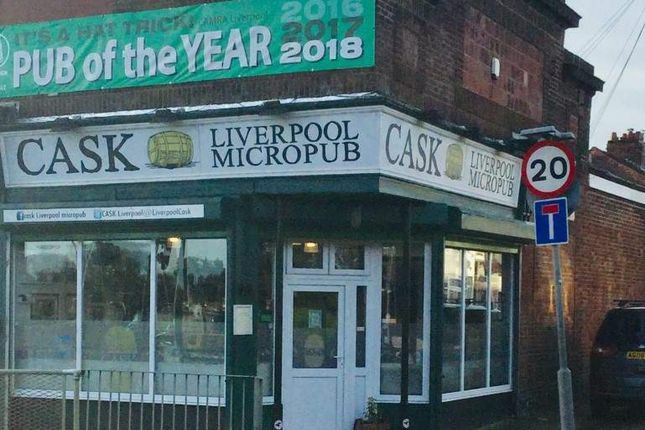 Cask Liverpool Micropub has been trading on Queens Drive since around 2015 with our client in ownership since opening. During that time, it has firmly established itself within the local community and within this business sector, gaining a good base of local customers in addition to plenty of passing trade. The business was awarded camra Liverpool & Districts Pub of the Year in 2016 and 2017 and has a great amount of excellent online reviews. Situated on a busy main road close to the Stoneycroft and Old Swan areas of Liverpool, the business is positioned within an area that is densely populated both commercially and residentially. This area is well linked by the M62, parking is available in the immediate area and public transport links are excellent. Cask Liverpool Micropub is only being offered for sale due to our client’s retirement. Cask Liverpool Micropub is housed within a single storey, end-terraced property with bold and clear signage displayed to both sides of the corner unit. Inside, the main bar area offers seating for around 35 with free standing tables and bar stools. The décor and lighting is neutral with a traditional pub feel. There is a small stock room and toilet facilities in place and also a fully equipped cellar with a professionally installed refrigerating unit. All areas are finished to a high standard with good quality fixtures and fittings in place. Cask Liverpool Micropub is currently operating with only our two clients in employment and no additional members of staff. Financial details are available upon a viewing of the business and Cask Liverpool Micropub has traded solidly over its trading history. The business generates an annual turnover of £106,455 (audited 05.04.2018) with gross profits of £49,803 (audited 05.04.2018). This freehold investment property and business is well positioned and well established with a good base of both regular and passing customers. There is plenty of scope for expansion with the introduction of longer opening hours and more beer choices along with a strong marketing drive. Early viewings are very strongly advised. Business & Property: £169,950.